Every October we challenge the cancer industry and go after the most egregious pinkwasher of the year. Campaign planning is underway. 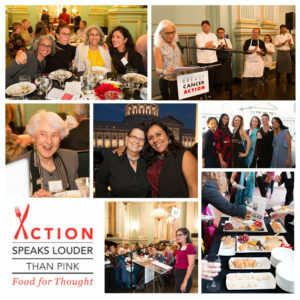 And we want to invite you to join us on October 15 for our 8th annual Action Speaks Louder Than Pink – Food for Thought fundraising dinner to support the campaign. We promise you’ll never see a pink ribbon the same way again! Last year, we had a full house. That’s why we want to make sure you don’t miss out on what is sure to be another powerful evening. Join with like-minded people and enjoy a special four-course meal prepared by some of the Bay Area’s best chefs. While you dine, you’ll enjoy a thought-provoking program highlighting our award-winning Think Before You Pink® campaign. *The venue is wheelchair accessible. Save the date, tell your friends, and stay tuned for more information about ticket sales, chefs, and sponsorship opportunities.